Super Woman Productions and Publishing offers media training services to individuals and organizations. Do you have goals related to being on television, in movies or on radio? Are you a singer, dancer, model or other entertainer looking to make sure you make the best impression you can the first time? Do you want to avoid becoming the punch line on late night TV after a news conference, debate or interview? Are you a Public Relations Specialist who has clients that are being interviewed in magazines or on television? Are you an organization that needs your executive staff or C-suite to be available and more prepared for interviews or media appearances? Are you an entrepreneur that would like to be better prepared to handle media opportunities and interviews? Are you ready to take your career to the next level and gain more exposure? If you answered “yes” to any of these questions, you will greatly benefit from media training to assist you on your career path. Media training will help you to feel more confident when speaking to anyone. Media training will teach you how to handle any situation that comes your way with professionalism and tact, while getting your point across clearly and concisely. Media training can assist you when auditioning for roles or interviewing for employment positions. Media training will diminish public embarrassment for yourself or your organization. 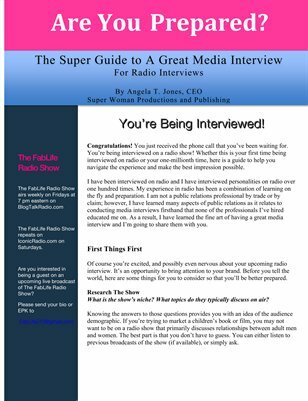 to get started improving your media interview skills! Media Training Sessions are available ONLINE! Based on individual needs an goals, it may be necessary to schedule more than one session or ongoing sessions. Bundles are available that include all of the services mentioned. Social media messaging for your brand (how to respond to negative comments and tweets). We are available to travel to you to provide these services in person for an additional fee. These services can be tailored into a presentation/workshop for large groups and companies. Contact us to inquire more about media training for groups and companies.